I have a confession to make. 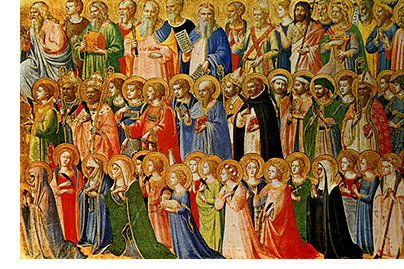 Today—this Solemnity of All Saints—is my absolute favorite feast of the year. I like it better than Christmas & Easter, more than the Annunciation or the Immaculate Conception. We need the prayers & example of the saints. Some days, in the Church calendar, there’s no saint to be celebrated. Other days, there’s a single saint. On some special days, there’s two, like Peter & Paul or Cosmas & Damian. Very rarely, we get to celebrate a bunch of saints on a single day, like St. Isaac Jogues and the other seven North American martyrs. Today puts all the other feast days to shame. Today, we celebrate All Saints—every last one of them. John Neumann & Katharine Drexel & Thomas More & Maria Goretti & Augustine & Francis & Therese & Dominic & Anselm. And, not just them, but all those small people in life, from among our own families & friends, who’ve “gone before us marked with the sign of faith” and whom we quietly hope have reached their reward in heaven. In chapter seven of the Book of Revelation, we hear the apostle John telling us about his vision of heaven. He proclaims: “I had a vision of a great multitude, which no one could count.” God wants to make us all saints, and He has the power to make it happen. Fortunately, becoming a saint isn’t so much about what we do as it is about what we allow God to do within us. If we cooperate with His grace in our lives, some day, this will be our feast day. We will have the privilege of praying for the next generation from on high. The Lord can make us part of the “great multitude” John saw in his vision of heaven. I, for one, want to be in that number!